Building upon the numerous successes of their 2008 full-length release, Californian Doomsters Jex Thoth are back with a new EP full of their usual old school magic. Two new songs and a cover of Slappy Happy’s Mr Rainbow are what we get, and it’s a decent addition to the band’s discography, if not quite the stunning masterpiece that I think they have in them. Raven And The Spirit storms in nicely, a retro stomp covered by classic organ sounds before slowing to a crawl as Jex’s voice strides out in powerfully melancholic tones. It’s something of a ballad, but an arresting, hypnotic one that makes full usage of the band’s sound to give it something of a classy feel. Interestingly, the following Slow Rewind follows in a similar style, slightly more upbeat and kicking up a gear towards the end in a similar stomp to the way the EP began. The cover is good, too, opening atmospherically with sinister ambience and chilling softly with Jex’s performance. And that’s it! Fifteen minutes of rather samey music that will do it for fans, but leave others puzzled. I do wish that the band allowed a little more of their retro wackiness to shine through – there are times here when they seem content to plod rather than bursting into glorious flight. Frontwoman par excellence Jex dominates proceedings, bar a catchy organ melody here or there, but it would be nice to hear a little more rocking from them. 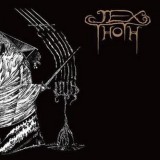 Still, what they do, they do quite well, and although hard to recommend to your average doom fan looking for riffs, Jex Thoth are still the bees’ knees when it comes to sounding like something your parents would like.